Home > Google News > Misc Google > Google India Diwali Doodle? Google India - www.google.co.in - does not currently have a special logo for Diwali, festival of lights. It is a celebratory set of five days that started today in India. Google India did post on their Google+ page this picture of a Google India employee making their own Doodle. At Google India we always love doing things a little different. 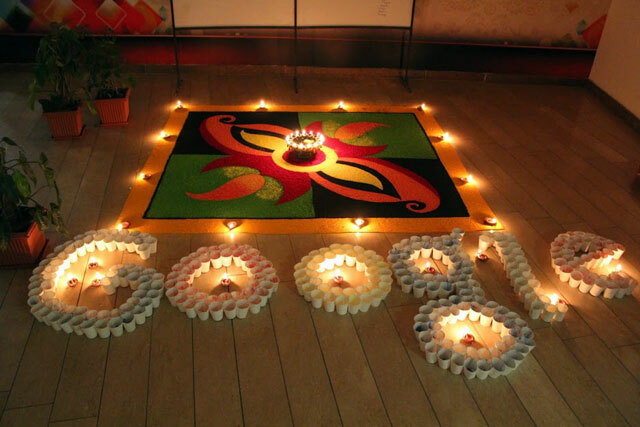 So this Diwali, India Googlers came out to make this unique Doodle Rangoli using recycled paper cups in our offices! Here's wishing our G+ family a very safe, happy and pollution free Diwali! But Indian Google users are not happy. There are dozens of threads in the Google Web Search Help forums (I linked to one) with complaints. Thanks for the feedback. This is especially appropriate, since we actually had a Diwali celebration at Google today. We're always on the lookout for new ideas, so I'll pass your feedback along to the team.